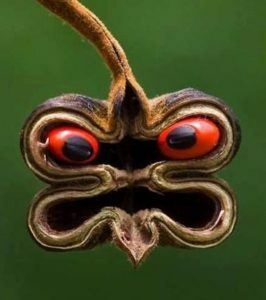 CLICK HERE FOR RARE HARD TO FIND SEEDS. Coco-de-Mer palms scavenge a lot of the nutrients shed in their own dying leaves. These trees can reuse 90 percent of that prized phosphorus from the fronds it’s about to drop. That’s a record for the plant world. The plants are frugal. 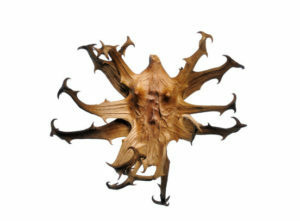 They sprout fronds using about one-third the nutrients needed by leaves of 56 neighboring species of trees and shrubs. Creating its monster seeds uses up about 85 percent of this plant’s supplies of phosphorus and the palms manage this thanks to drainage. The palm’s curving leaves can span 2 meters or 6.6 feet. The leaves resemble folded paper fans and any rains falling on them funnel down the stems. The water washes animal droppings, stray pollen etc. – a nutrient windfall — off of the palm and onto its hungry roots. 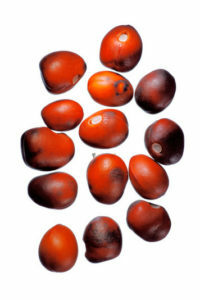 Each giant seed takes about six years to grow once the palm reaches plant maturity that may take 80 to 100 years. Then the palms can yield its first seed. 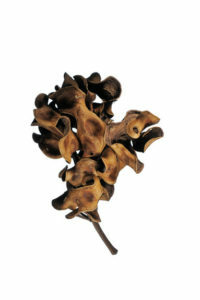 Throughout the palm’s life of several hundred years, it may bear only about 100 seeds. Few of those monster coconuts will get a chance to replenish the dwindling Coco-de-Mer forests, however. It is calculated that 20 to 30 percent of the endangered species’ seeds must sprout to keep the forests growing and healthy. That has not been happening. 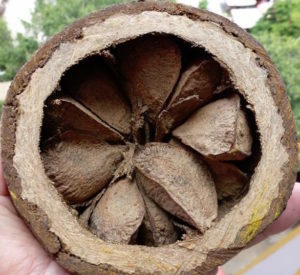 Nut poachers have been illegally kidnapping the seeds and grinding them into a powder they sell. I HAVE ALWAYS BEEN IN AWE OF THE INCREDIBLE DESIGN AND PATTERNS IN NATURE . . . FROM SEEDS TO POLLEN GRAINS. 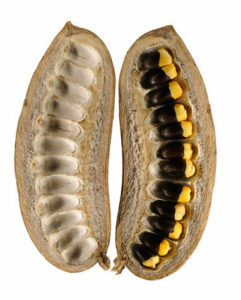 HERE ARE A FEW PICTURES OF SOME INTERESTING SEEDS SHOWING THEIR DIVERSE COLORING AND SHAPES. I collect seeds all the time. 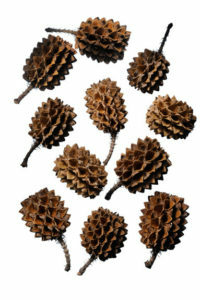 Seeds are as distinctive from one another as grains of pollen or people. It is the beautiful flowers that make incredible seeds that can stick to you, fly or float. Seeds feed the world! Seeds that feed most people: Corn, Rice, Bread, Cereal, Pasta, Beans, and Nuts. I love seeds as much as I love dirt! You can use a big basket and clippers to collect seeds, snipping mature flowers, seedpods or stems. Hang the stems for seeds to drop onto paper. You may spread seeds on paper or put in a basket to air dry for about a week. For zinnias, just clip the flowers, let them dry and pull the petals off. 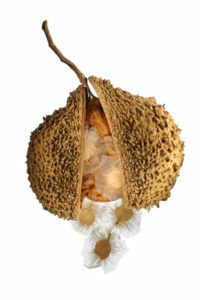 The seeds are attached to the flower petals. If you hang catnip, the tiny seeds fall onto the paper. Remember the food you buy may also contain mature seeds for you to sprout! Store seeds in envelopes labeled, or plastic snack bags, film canisters or glass jars. They must be dry before you seal I don’t store seeds in my refrigerator unless I eat them. Some seeds must be frozen though before they will sprout. I seal seeds in envelopes and keep in a big basket in a cool dry spot. Bugs like to eat seeds, so make sure seeds are sealed. Humidity and warmth grows mold and rot. Most seeds last about 3 years Plant open-pollinated varieties of plants and they’ll come back true; Seeds from hybrid varieties won’t come back true. 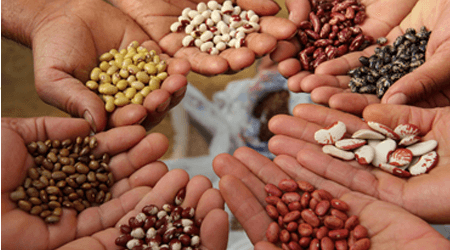 Harvesting seeds is sustainability in one of its purest forms. Cut the stem at the base and shake the seed head inside a paper bag. If the seed heads are not fully dry or ripe hang the stems with seed cases intact or lay them flat to dry on a paper or tray away from direct light. If seeds are not dry they will mold in storage. Break open the seedpods. Separate crushed debris from seeds by sifting. Seeds from fruits and vegetables should be collected before they’re over-ripe. 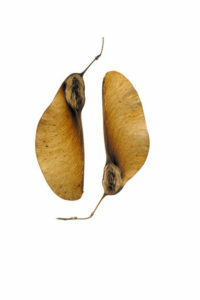 Vegetables such as beans should be harvested when pods are dry. Vegetables with wet pulp such as tomatoes, pumpkins and squash can be separated from the pulp and laid out to dry on newspaper. 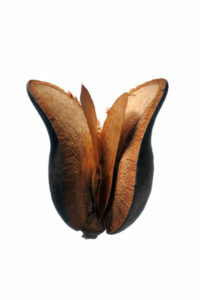 The seeds of harder pulp fruits and vegetables are simply opened by crushing and removed manually. The best way to store seeds is to package them in paper envelopes or bags. The temperature should be cool for longer storage. Write the name and date on the envelope. 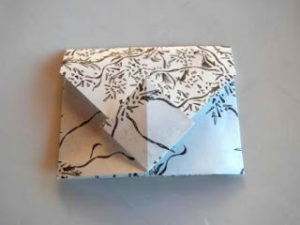 To start making seed packets; below is a simple tutorial to create your own miniature origami envelopes. Enjoy! 1. Cut a piece of paper into a 4″x4″ square. Place the square facedown. 2. Fold the paper in half diagonally to make a triangle. 3. Fold one corner down to meet bottom edge. 4. Fold right corner over 1/3 of the way across the bottom edge. 5. Fold the left corner over 1/3 of the way across the bottom edge. 6. Fold corner back over to the left 1/2 of the way across the bottom edge. 7. Stick your finger into the small pocket triangle and press it open to make a square. 8. Fold top corner down to create a crease. 9. Fill your envelope with your collected seeds. 10. Fold and seal to keep any critters who love seeds out! Store your decorative envelopes in a cool, dark place to give as a gift or plant when the time is right! As we’ve come to depend on a handful of commercial varieties of fruits and vegetables, thousands of heirloom varieties have disappeared. It’s hard to know exactly how many have been lost over the past century, but a study conducted in 1983 by the Rural Advancement Foundation International gave a clue to the scope of the problem. It compared USDA listings of seed varieties sold by commercial U.S. seed houses in 1903 with those in the U.S. National Seed Storage Laboratory in 1983. 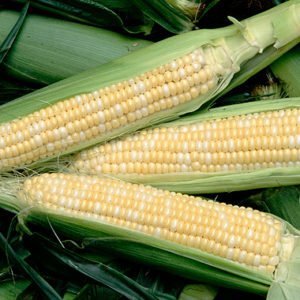 The survey, which included 66 crops, found that about 93 percent of the varieties had gone extinct. Ninety-four percent of vintage open-pollinated fruit and vegetable varieties have vanished. Many farmers stopped saving seeds and embraced hybridization, genetic modification, and seed patents for money and now multinational corporations control our food supply. They are known to take little-known varieties of seeds, patent them, and demand royalties from farmers whose ancestors grew them for centuries. Seeds are disappearing, crops are stripped of the ability to adapt, and the food supply is at risk. Yanna Fishman, the sweet-potato queen, has a wild garden in the highlands of western North Carolina, and grows 40 varieties of sweet potatoes. Dave Cavagnaro, an Iowan photographer, teaches people to hand-pollinate squash with masking tape to keep vintage varieties pure. Seeds don’t just grow plants; they build stories, heritage, and history shared every time seeds pass hand-to-hand. Our relationship to the land is very powerful. Pharmaceutical or chemical companies sell 91% of seeds. 1.4 billion pounds of Roundup are used a year. 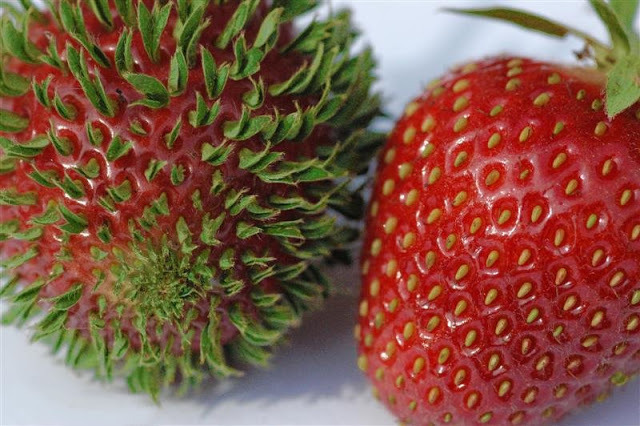 Eighty percent of food produced is genetically modified. 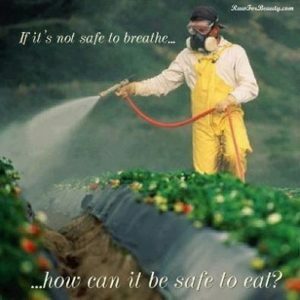 Dow took over agriculture and Monsanto and DuPont are the most toxic and unregulated. They want to patent and own seeds, takeover the seed and food supply, and the plant world. Natural selection is evolving to a controlled environment, limiting the diversity of life and interrupting the natural process of evolution and natural selection.. You cannot save seeds from hybrids they develop. A seed dictatorship is being established. Our next famine could be a seed famine. If you haven’t seen this documentary, you should! Safe Seed Companies that have taken the Safe Seed Pledge and tested their stock to be free of GMOs. These ten companies foster greater sustainability for people and the planet. They specialize in rare seed preservation and are not affiliated with Monsanto or GMOs in any way. Renee’s Garden Seeds is run by gardeners for gardeners. Renee handpicks and sells varieties that are very special for home gardeners, based on flavor, easy culture and garden performance. Seeds are time-tested heirlooms, the best international hybrids or fine open-pollinated varieties tested and guaranteed for every major U.S. climate zone. Individually written seed packets offer beautiful watercolor portraits, with personally written descriptions, growing instructions, a quick-view planting chart, growing tips, harvesting information and cooking ideas. A non-profit working to save heirloom garden seed from extinction by preserving varieties of seed gardeners and farmers brought to North America when their families immigrated, and traditional varieties grown by American Indians, Mennonites and the Amish. Baker Creek is a family-owned business offering the largest selections of heirloom varieties in the U.S. and one of the largest selections of seeds from the 19th century, including Asian and European varieties. They specialize in rare and hard-to-find heirloom seeds from over 75 different countries. Clear Creek is a small, family-owned business specializing in open-pollinated heirloom seed varieties. They offer several variety packs and have a smaller selection. 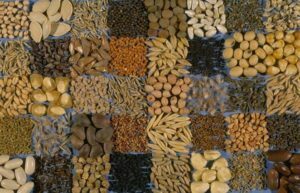 Southern Exposure Seed Exchange offers varieties that perform well in the Mid-Atlantic and Southeast, and many unusual Southern heirlooms. Consumer members own 60 percent, and employee own 40 percent. Because the cooperative doesn’t have an individual owner, profit isn’t its primary goal. Their seeds and other products are quite affordable. Fedco evaluates hundreds of varieties of hybrid, open-pollinated and heirloom seeds identifying the ones that are most productive, flavorful and suited to the northeastern U.S. climate. Peaceful Valley offers a large variety of organic seeds and a great selection of gardening tools, pest control, season-extending products, composting supplies, growing, propagating and irrigation equipment, and books. They offer special pricing programs for farmers, school gardens and landscaping businesses. This is a large, well-known employee-owned seed company with more than 1,200 varieties of hybrid, open pollinated, and heirloom vegetables, flowers, and medicinal and culinary herbs. They offer large quantities of seed and cover crops, high quality gardening tools, equipment and accessories, soil amendments and organic pest control products. Their site and catalog is full of detailed growing instructions and tips. Territorial Seed is a large, family-owned company offering hybrid, open-pollinated and heirloom seed varieties. Territorial’s germination standards are higher than prescribed by the Federal Seed Act. Their farm is certified USDA Organic. Seeds of Change was acquired by the Mars company, a supporter of GMOs in their food products. Demand for healthy, organic products is high and many organic brands have been bought out by industrial food corporations. Seeds of Change offers 100% certified organic open-pollinated, hybrid and heirloom seeds. They grow their own seeds on their research farm or within their network of organic farmers. They have the marketing power of a large corporation now and you can get their seeds at Home Depot, Lowe’s, Wal-Mart, Whole Foods, and other retail chains. Seeds of Change is the only organic, open-pollinated seed company available at mainstream stores nationwide. Seeds Feed the World . . . from rice to corn to beans! There are many kinds of plants and most have seeds that under the right conditions will grow a plant just like the one that the seeds came from… Seeds look dead, but they are little packages of life. Seeds may be as small as a speck of dust or as large as a football. There are small seeds that produce large plants and large seeds that produce small plants. The average size of a seed is about the size of a rice kernel. 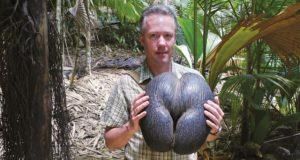 The largest seed is the coconut that can be as heavy as 50 lbs. Seeds come in many different kinds of seed packages. Some may contain only one seed and some may contain thousands. 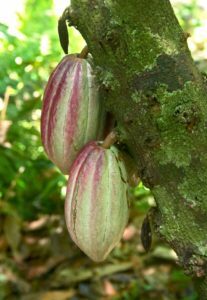 The seeds may be covered by a husk (corn), skin (cherry), pod (pea), rind (lemon), peel (banana), shell (nut), or hull (grain). 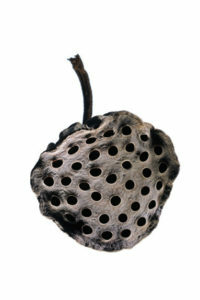 Seeds may also be inside a pit or stone such as in the peach or cherry. 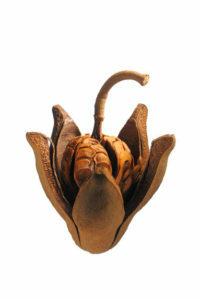 Seed packages come in many shapes and sizes such as fruits, nuts, and pods and cones. Some grow quickly and some grow very slowly. Some will die if they are planted too deep in the soil. 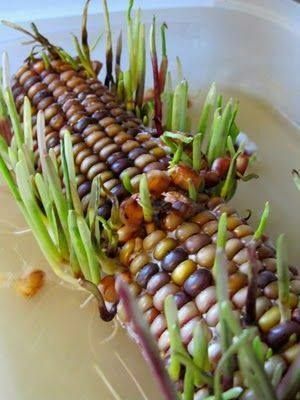 Some require a freeze and some constant warmth or great heat to germinate and sprout. There are many ingenious ways that seeds travel. Birds that eat them deposit them elsewhere, they are carried by the wind or ocean, are shot out of a pod, are buried by animals, or have barbs, hooks, or spines that stick to things. Some seeds have wings and hair! For a seed to grow it must have just the right amount of water, soil, and sun. All seeds have a tiny plant inside, the embryo, with one or two seed leaves (the cotyledons.) All seeds have an endosperm, which is food for the new plant until it is established. If the conditions are right the seed will germinate and sprout. Different kinds of seeds take a different amount of time to germinate. 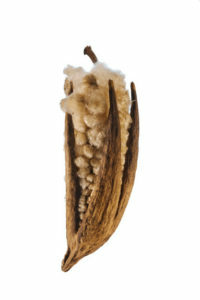 Seeds have seed coats and water causes the seed to swell inside creating pressure that cracks open the coat for the sprout to grow. First, a tiny root is sent down into the earth to drink water and get nutrients. Then a little stem reaches out for the sky and 2 small leaves (cotyledons) appear. The little seed has sprouted and the roots, stem, and leaves continue to grow. Soon little buds will appear and open into flowers. Mostly insects pollinate flowers and then fertilization occurs. A little yellow pollen grain from the stamen of the flower lands on the pistil of the flower and grows a tube down to the ovary of the flower that holds the ovules or eggs. An ovule is fertilized and a seed is formed. Some seeds stay dormant through the winter till spring comes. 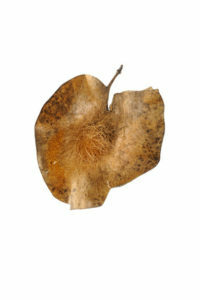 Scientists have been able to sprout some seeds that have been dormant for a very long time. You can also propagate (make new plants from older plant parts) plants from stem, root or leaf cuttings and from layering. What is the saddest seed? The weeping willow. Why did the seed shiver? Because it lost its coat. Seeds Feed the World . . . from rice to corn to beans! Seeds look dead, but they are little packages of life. They may be small as a speck of dust or large as a football. There are small seeds that produce large plants and large seeds that produce small plants. The average size of a seed is about the size of a rice kernel. Seeds come in many different kinds of seed packages. Some contain one seed and some contain thousands. Seeds may be covered by a husk (corn), skin (cherry), pod (pea), rind (lemon), peel (banana), shell (nut), or hull (grain). Seeds may also be inside a pit or stone such as in the peach or cherry. Some seeds grow quickly and some grow very slowly. Some die if planted too deep. Some require a freeze and some constant warmth or great heat to sprout. 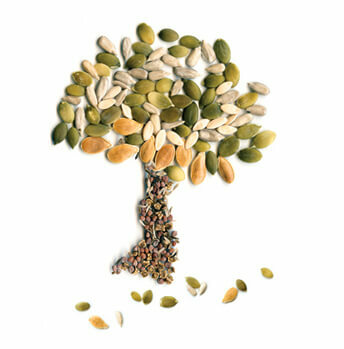 Seeds travel in ingenious ways. They travel as food, are carried by wind or ocean, shot out of a pod, buried by animals, or have barbs, hooks, or spines that stick to things. Some seeds have wings and hair. For a seed to grow it needs the right amount of water, soil, and sun. Seeds have a tiny plant inside, the embryo, with one or two seed leaves (the cotyledons.) All seeds have an endosperm, food for the new plant until it is established. Seeds with hard seed coats can be soaked overnight to soften them for sprouting Okra and moonflower are seeds I always soak. 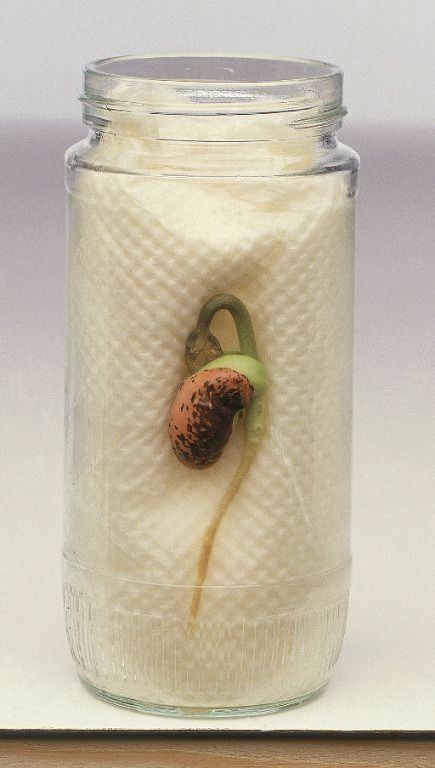 Seeds have seed coats and water causes the seed to swell inside creating pressure that cracks open the coat for the sprout to grow. First, a tiny root is sent down into the earth to drink water and get nutrients. Then a little stem reaches out for the sky and 2 small leaves (cotyledons) appear. Mostly insects pollinate flowers and then fertilization occurs. A yellow pollen grain from the stamen of the flower lands on the pistil and grows a tube down to the ovary of the flower that holds the ovules or eggs. An ovule is fertilized and a seed is formed. Starting seeds indoors gives you earlier vegetables and flowers and cultivar choices are endless. Gather containers, soil mix, watering can, marking pen, and seeds. Soaking seeds with hard coats like peas or okra overnight before planting shortens sprouting time. Choose containers with good drainage. Once seedlings form true leaves they need space for root growth. Peat pots, newspaper pots, cardboard tubes, or soil blocks go right into the soil. Potting Mix – Combine equal parts compost and vermiculite. Moisten soil with warm water; fill containers and plant seeds! 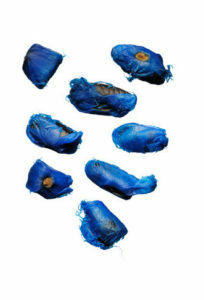 Space large seeds 1 inch apart, medium seeds ½ to 1 inch, and tiny seeds ½ inch. Sprinkle small seeds evenly: Take a pinch of seeds and slowly rotate to release the seeds or scatter fine seeds from a saltshaker. 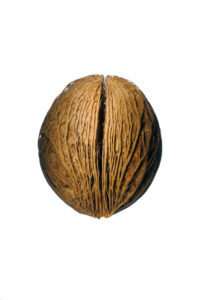 Cover the seeds to a depth of three times their thickness by sprinkling with light dry soil and gently pat the surface. Label before mix-ups. Put the containers in a warm place and mist the soil until they sprout or set the pots in shallow containers of water. Once they develop true leaves, transplant. From left to right: Black Oak, Valley Oak, Q. Oregon Oak, Coast Live Oak, Blue Oak, Tan Oak, Canyon Live Oak. Healthy Seeds! When you are planting seeds this spring remember all the benefits from eating some of them! Hemp Seeds provide all nine essential amino acids, the vital proteins found in meat and dairy. The shelled seeds have a mild sprouty taste. Flax seeds are a great source of lignans, a plant chemical that may lower your risk of heart diseasee. Grind the seeds to absorb the nutrients more easily. Mix seeds into flour when baking or add to soups and casserloes. Pumpkin seeds are rich in potassium to help regulate your heart beat and blood pressure. They have seven times the magnesium to boost your immune system! Chia seeds are full of heart healthy omega-3 fatty acids. Add to salads or sprinkle on oatmeal. Black sesame seeds are full of antioxidants and have a surprising dose of iron and bone building calcium and may help prevent high blood pressure. They taste best toasted. Sprinkle then on a stir fry. Sunflower seeds are one of the richest sources of the disease-fighting antioxidant vitamin E. Eat then as a snack or add to salads or baking. Mustard seeds have an incredible amount of health benefits. They are low in saturated fat, cholesterol and sodium and are a rich source of dietary fiber, protein, calcium, iron, magnesium, phosphorus, manganese, and selenium. EFFECTS ON CANCER – Mustard seeds are a rich source of glucosinolates. Additional enzymes in the seeds break up glucosinolates into other phytonutrients called isothiocyanates. Isothiocyanates inhibit growth of existing cancer cells in addition to protecting these cells from forming. 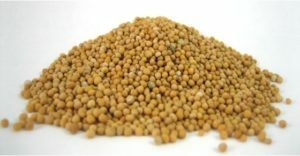 Mustard seed powder, rich in allyl isothiocyanates significantly inhibits the growth of bladder cancer. EFFECTS ON THYROID FUNCTION – Selenium is found in high levels in mustard seeds. One tablespoon provides 21% of our recommended daily intake. This mineral is a powerful antioxidant and helps reduce the severity of asthma symptoms, rheumatoid arthritis symptoms, lowers blood pressure, reduces migraine attacks and helps prevent cancer. Selenium boosts an underperforming thyroid hormone T4, into the more active T3 and is essential to maintain a healthy thyroid function. ANTI-INFLAMMATORY PROPERTIES – Curcumin is present in mustard seeds. 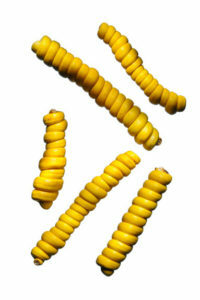 Curcumin are powerful antioxidants with proven benefits at fighting cancer and is a strong anti-inflammatory compound. Curcumin reduces pain in inflammatory illnesses including rheumatoid arthritis, irritable bowel syndrome and inflammatory bowel disease. Mustard seeds and the powder can be added to many dishes, stews, curries, marinades, vinaigrettes, smoothies or simple dipping sauces.